"Ophanim" is the name for a specific system of "sacred" physical postures and internal exercises which are based on the Hebrew alphabet and Jewish mystical tradition (Kabalah). It is a kind of Jewish "yoga" in the true sense of a practice which unifies and heals the spiritual, mental, emotional, and physical sides of man. It works with only a relatively few postures in a specific order based on the earliest Jewish mystical text called the Sefer Yetzira (the Book of Creation/Formation). Ophanim works simultaneously as a physical exercise, breathing practice, meditation on breath, body awareness, and internal sound, attunement with the creation, clearing of the mind and renewal of internal energy. It is comparable to the Chinese Chi-kung exercises in terms of renewing internal energy. We call the postures of Ophanim "sacred" because they are more than just useful exercise forms. They are the physical manifestations and embodiments of "angels", messengers or messages originating in the Will of the Divine Source. To do the postures is to practice an expressive language of the body which (re-)enacts letter by letter the ongoing structure of the world and harmonizes the soul with the larger creation. On a psychological level working with the letters helps to develop a bridge of communication between the most interior and most exterior parts of the soul. A person is more able to listen to and distinguish their inner voice, the voice of God within. In terms of physical health and healing, the letter postures revitalize and harmonize all of the energy channels of the body. This effect is usually the first to be noticed. Ophanim is a system including meditation, internal exercise, and physical postures. It presents the return of a form of "yoga" or unification of soul, body and world which, according to the Kabalists, goes back to the creation of man and is considered to be part of the universal heritage of humanity. Ophanim has similarities with many eastern systems of yoga, internal exercise, and internal energy, but it is clearly rooted in the ideas of the Jewish mystical tradition. Although it may sound complex, the postures of Ophanim constitute a much simpler system than modern systems of Indian yoga. A person does Ophanim to the extent of their personal ability and comfort. The emphasis is intrinsically more on the meditative practice than the physical stretching or exercise. The Ophanim postures consist of only 27 (22 letters and 5 finals mirroring the Hebrew alef-bet) postures with some variations. A basic set includes five constant postures plus two others selected according to the month and day of the week. Other postures may be done for specific mental or physical healing or a more intensive practice. A basic set takes from 15-25 minutes. From this comes a sense of well-being, soul-body harmony, and increased internal energy which is simultaneously a meditation on the name of God, and a "prayer of the body." It says in the Bible that man was created in the "image of God". Jewish tradition is emphatic that we cannot speak of God having any form whatsoever. The forms in the created world including the human body are, in this sense, symbolic representations of the higher, Godly reality. There is a connection between the higher and the lower. This connection is through the Hebrew letters, which are the archetypes for the created world. The structure of Ophanim is based on the Sefer Yetzira, the earliest known text of the Kabalah. The book explains the creation and maintenance of the world by means of the Hebrew letters, how every facet of creation in respect to time, space, and being or consciousness is rooted in certain letters. In doing Ophanim every letter-posture has correspondences to different elemental energies and parts of the body. The practice involves receiving and consciously directing an influx of vitality through the body while doing the postures in order to harmonize and restore these energies. According to the Kabalah, man is meant in a central way to co-operate and communicate with the creation through working with the letters, to name, to understand and to co-create. One form of this communication or attunement is accomplished in Ophanim by practicing the letters in a certain order, which includes doing certain "constant" letters, and those which are done according to the specific month and day. Ophanim is a way to both interact with and explore the abstract concepts of the Sefer Yetzira in the realm of the body, the most external part of the "soul". It combines physical letter postures and "internal exercises" which bring the letters to life. 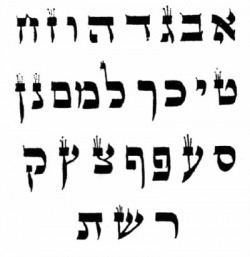 The "internal exercises" consist of a meditation technique working with a specific breathing, body awareness, and mental vocalization all related to the Hebrew name of God written with the letters "Yud -- Heh". This name is familiar to many from the Hebrew "Hallelu--YaH" which means "praise God (YaH)". It is one of the most important names of God in Hebrew. The reason for working with the name YaH is that this name refers to the attribute of Divine Wisdom (Chochmah), whose function is to bring about constant renewal at every level of the creation. We can renew ourselves completely, each moment, breath by breath, through activating this attribute within. The letters yud and heh (the 10th and 5th letters of the Hebrew alphabet) have the numerical values of 10 and 5 which are expressed in the following breathing technique. First, gently inhale to the count of ten. Then, without pause or holding the breath, exhale to the count of five, emptying the lungs. Breathe in and out through the nose only, preferably with the eyes closed. One can take a pause before going into the next breath. Please note: this technique is given here to show the relationship between "theory" and practice, how one can approach a "name" of God, expressing, at first, part of its meaning directly through the body. On the foundation of the breath, we add the expression of the name translated into an awareness of different centers in the body, and a mental vocalizing of the sound of the letters. 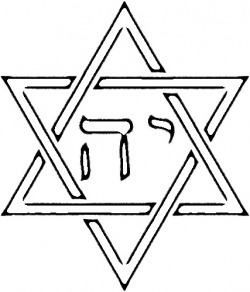 The name is the focus for the "yoga", union (in Hebrew: yichud) of the breath, awareness, and mental vocalizing. Some may want to use these directions to begin to learn the practice. It is the first step of the "internal exercises" that are done with each of the letter-postures, and can be safely done for a short period of time (5-10 minutes). It is best to learn this technique from an experienced teacher. Many practitioners have noted the power of doing the 10-5 breathing. The tradition of our teachers holds that it is the original human breathing rhythm, which, in itself, is "calling" the name of God, maintaining a state of awareness and renewed vitality. This breathing can have great benefits for healers and healing. For example, recently three expectant mothers found that practicing the 10-5 breathing during labor greatly facilitated remaining "conscious" with renewed vitality, and ability to detach from the physical pain. One healer, doing this breathing for the first time in a workshop, was immediately aware of its life-giving power, and after incorporating the breathing in her work, wrote back to us saying that she called it the "Breath of God". As awareness about Ophanim has spread, many have come to find that a powerful, efficient, and profound practice of "yoga" exists within Judaism, which is now available to experience for all. Classes were taught in the U.S. starting in 1995, and there are now teachers practicing in Israel and throughout the U.S. and Canada. Many people involved in yoga practice and in forms of spiritual healing have been drawn to the promise of a practice rooted in mystical Judaism. For many it is a completely new and profound experience.